For some time now, my children are complaining about their PCs. The systems fail when playing The Sims, editing videos, and playing some online games. In particular, the failure to do online games triggered me. It is clear, the kids need new PCs, and these PCs have to satisfy the requirements stated below. All children need to get the same PC. Otherwise there will noticeable unfairness, hence noticeable drama. On the other hand, each kid has its own special wishes, and its PC needs to be customizable to accommodate these wishes (within reasonable limits). We solve this paradox by delivering equal basis systems to all children. Each kid can then use its own savings to customize its PC. The PCs need to be future proof. That is, not composed of outdated components. And we also want the parts that will last long to be of excellent quality. The PCs need to be quiet. Except perhaps at incidental extreme performances. Well audible PCs are very irritating. I myself have some frequency dips in my hearing, due, I think, to learning to suppress the PC noise of early PCs, during more than just a couple of years. A new PC should consume less energy than an older one. That should be obvious. For some odd reason we’re drowning is displays, mice and keyboards, all well -re-usable. We can also strip the DVD writers (readers) from the old PCs. Look, DVD writers are hardly ever used, so, although they are very cheap (€ 15,-), we will not spend money on new DVD writers. The new PCs also need a backup facility. We will use the hard disks of my old NAS, by now retired, as backup disks. These disks are IDE disks; too slow for primary use, but since each has a capacity of 500Gb, ok for backup purposes. You would almost forget it, but a PC also need to be affordable. For a start we will assume a focus point of € 500,- per PC. Enough for quality, too little for indulgence :-). Our starting point will be the desktop-best-buy-guide of September 2013 on Tweakers.net (in Dutch), in particular the basic and mainstream game systems. Game Systems are much like media systems, the main difference being overclocking. We are aiming at a basic-to-main media and / or game system. 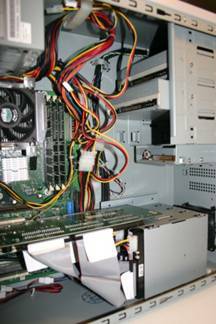 This best buy guide provides us with the expertise available at the forums (for a), especially in the discussions concerning the components to choose. From the proposed system we pick the parts we like or choose alternatives that seem more appropriate given more or other information. A very nice aspect of the Tweakers.net site is that we can directly see what the prices are in a broad spectrum of shops. An alternative source of advice and prices is hardware.info. With respect to processor choice, the Tweakers.net site is at the moment just the place to be. There has been a heated discussion concerning the choice between the AMD FX-8320 Black Edition and the Intel Core i5 4670K Boxed Haswell processors. I will explain the difference by motivating my preference. The AMD processor is a bit dated. Its successor will be launched in the near future. This fact lowers its price to a great value-for-money level: The average performance level of the processors is comparable, but a current combination of processor and mother board is in case of the AMD processor about € 100,- lower. So, would you be willing to sacrifice the “future proof” requirement for € 100,-? I will not. – It is recent; on the Dutch market only since June 2013. – It is designed to save energy. – It uses a new socket that we hope will be current for a while, so we might replace the processor by a successor without also having to replace the motherboard (that holds the socket). – Very importantly: it has an internal graphical processor (igp). This igp is strong enough to run the previous generation of most-resource-hungry games, at not-the-highest-quality level, that is, it is excellent for your daily use. The AMD processor does not have an igp, so you will always have to buy a graphics card – that’s your € 100,- price advantage. – The Intel processor is tested to have better performance in applications of video processing, so the Intel processor contributes to that requirement. One final point. The processor proposed by Tweakers’ is of “K” type: suitable for overclocking. Overclocking can damage your processor and other hardware. So, this is not a facility we will hand over to (inquisitive) children. Our choice is therefore the Intel Core i5 4670 Boxed, without the “K”. This saves us some € 10,-. Tweakers.net proposes the Gigabyte GA-Z87-HD3 mother board. This is a Z87 chipset mother board. For the new Haswell processor there are three different chipsets: Z87 for overclockers, H87: for mainstream systems, B87: with the ‘B’ of budget. So, we don’t want a Z87 board, we want a H87 board, which will (no doubt) be cheaper. 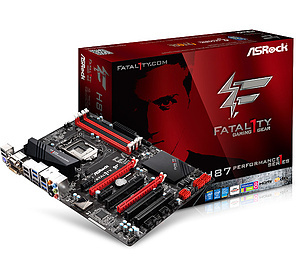 We prefer the ASRock Fatal1ty H87 Performance over the price comparable Gigabyte H87 board. The reason is that the ASRock has a better sound system: newer chip, pre-amplifier for headphones, connector for a surround system amplifier. It has also an newer LAN network chip, and it is a bit cheaper. Compared to the Gigabyte it has less precise control over the cooling fans, but we were not planning to get continued maximum performance from these PCs anyway. I suspect that a comparable H87 Gigabyte board will be a micro ATX board, a very small board. I consider that a disadvantage since it requires extra cooling measures. The Dutch Hardware.info site has published an extensive evaluation of Haswell motherboards, see it for many more details. Perhaps this same evaluation has been published at other Hardware.info sites as well. At this point I really passed by the Tweakers list. AnandTech.com also reviews PC cases. Their regular guy is fond of the Nanoxia PC cases. Nanoxia is a somewhat high end brand for PC cases. They provide heavy, strong, silent and very good looking cases. And in three colors. Real thorough, sound German engineering. I really like the lasting, silent and esthetic character of this case. It could easily last for 20 years, hold many successive PCs, and never be the rotten apple of your interior. The preferred model is the Nanoxia Deep Silence 2. It is smaller than the Deep Silence 1, which we consider an advantage. An alternative would be the Corsair 330R. However, this case is a step back in all aspects (according to AnandTech), and available in any color … as long as its black. Both Tweakers’ lists suggest the same RAM memory and hard disk. 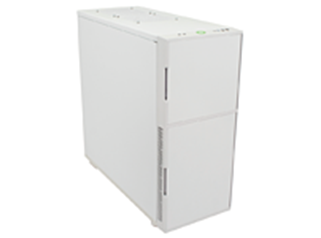 We choose a modular power supply from the suggested alternatives. ‘Modular’ means that you only have the cables you actually use in your PC (instead of all of them: non-modular), which eases cable management within the case a lot (at € 2,50 extra). Prices tend to fluctuate, so the Total is an approximation. And yes, I admit this Total is a bit higher than the original intention :-). Kids can optionally add various components such as a (single) powerful graphics card, multiple (two, three) 16:9 displays, advanced audio equipment, up to 32 GB of RAM memory, up to six hard disks (of any size), in a RAID configuration that supports performance or fidelity, or both, Bluetooth, an additional four cooling fans, etc. etc. The proposed system is not suited for long-lasting extremely high performance, or for use with multiple graphics cards.